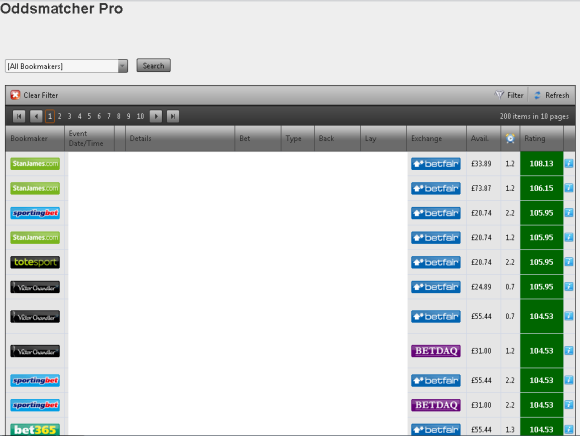 We have some very exciting news here at bet72.com as we unveil the brand new version of Oddsmatcher, Oddsmatcher Pro. **** New Ice Hockey Winners market now added for the new NHL season! Look at what you get…. Want to see what this is all about. Here’s a few random screenshots taken over the last few days……It’s Green All The Way! And to celebrate we have all this for a limited time at just £10 per month, yes the is TEN pounds a month! You could have made your monthly tenner back instantly thanks to some very juicy price opportunities alone! We are seeing these sorts of opportunities all the time in the software. 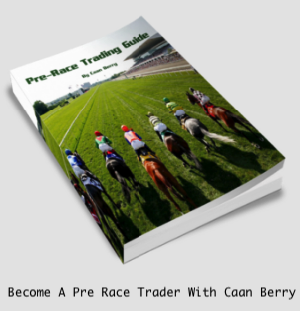 So when you combine that with the free bet offers too and the potential for creating risk free trading insurance as well, this has to be the most powerful tool in your bag to help you really maximise your profit potential. We have loads of extras going on with the software over the next few days with a full set of video tutorials, members only webinars and help packages plus a new area dedicated to utilising bookmaker offers for getting instant free trading insurance, wow! But we couldn’t wait any longer to get the software out there to see what people thought and, more importantly, to get people making some extra profits. So if you fancy getting on board then please click below to find out more…. We are the ones who gave Oddsmatcher it’s name. Whether you use the Standard or Pro version it’s up to you. Here’s a comparison of the main features the Standard and Pro versions of the software. Now here’s a name that you wouldn’t normally associate with Sports betting, PokerStars but yes the world’s largest poker site now has a fantastic new sports arm to their business with some fantastic offers too. And we are delighted to welcome them, as our latest addition to our flagship Oddsmatcher and Oddsmatcher Pro software too. The site has a brilliant new signup offer and once you are done with that, then there are a whole host of existing user offers and bonuses, as well as a casino to take a look at and of course the Poker area where you’ll find more tournaments and games than any other poker site. We are offering special enhanced prices on the following matches for October 4, 2015. These enhanced prices are only available to players placing their first real money sports bet at PokerStars. Place a single pre-match bet on one of the enhanced price markets featured above at the current market price (maximum stake $/£/€10). If your bet wins we will pay out your winnings from the current market price immediately. Additional winnings from the enhanced price element will be paid in Free Bets within 48 hours. And just look at these current existing user offers too…. Missed out on a big football accumulator because of a last-minute penalty or maybe one of your teams suffered a surprise loss? Whatever the reason, don’t see a great football accumulator crumble because of one bad result. Thanks to our Bad Beat Football offer, you can get a refund up to $/£/50 on losing accumulators! Place a sixfold (or higher) football accumulator in the win-draw-win market and if only one of your legs lose, we’ll refund your stake as a Free Bet up to $50/£50/€50. Note that all selections in the accumulator must have odds of greater than 1.2. Place a single bet of $/£/€1 or greater on the pre-match ‘Correct Score’, ‘Halftime-Fulltime’, ‘First Goalscorer’, ‘Last Goalscorer’, or ‘Match Result and Both Teams to Score’ Market of any game in those leagues listed above, and if it finishes 0-0, we will refund your stake as a free bet up to a maximum of $/£/€50. Love betting on tennis? PokerStars is serving up a special offer that means you’ll never have to suffer another tennis bad beat. Miss out on a big tennis accumulator by just one leg and we’ll refund you with a Free Bet up to $50! Place a sixfold (or higher) tennis accumulator in Match Betting or Set Betting markets, and if only one of your legs lose, we’ll refund your stake as a Free Bet up to $50/£50/€50. Note that all selections in the accumulator must have odds of greater than 1.2. 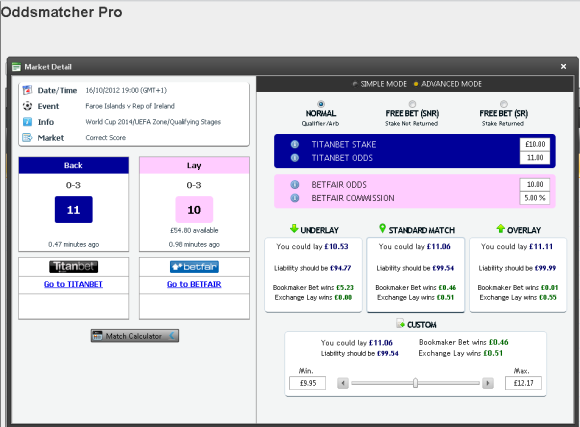 Match Betting and Set betting markets. Within 48 hours of your qualifying bet being settled, we will credit your account with your Free Bet. You can view the Free Bet under the ‘Bonus Bets’ tab in your account, located just next to the Bet Slip. You must use your Free Bet within seven days of receiving it. Your Free Bet will expire if left unused within seven days. 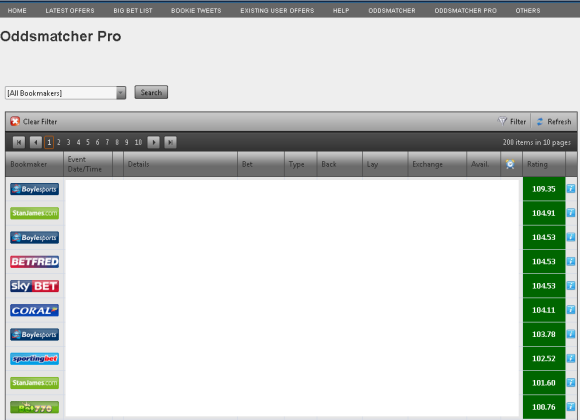 Like we say we have added PokerStars to our own software Oddsmatcher and Oddsmatcher Pro. 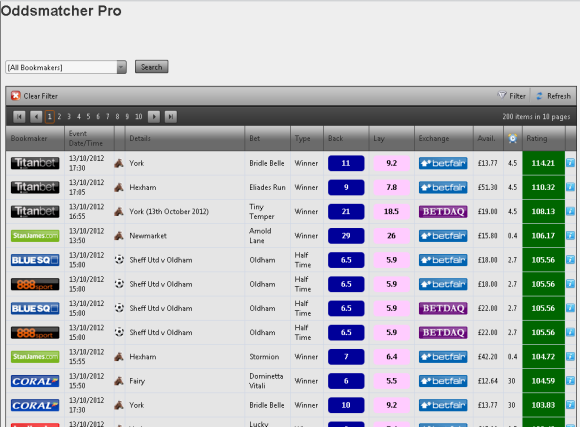 And with the Pro version covering more markets that you can shake a rather large stick including full football and tennis ones then you can literally cover the £10 a month cost for full unlimited access to the software with just one of the offers above and these are set to grow and grow throughout the whole season. Plus you will get free access to our new Private Facebook Page, exclusively for all Oddsmatcher Pro users, where we have an ever growing community of like minded players and traders all helping each other make even more profits. 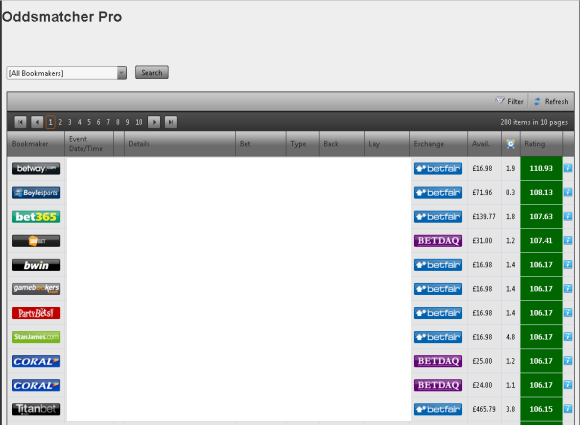 We have some exclusive member only offers as well as hints, tips, trades and much, much more and all free for Pro users. It is the perfect place to ensure you maximise offers like the ones above. Blimey when you are done with this lot you will have probably covered a lifetime of subs to the software anyway! Anyway first thing to do is grab a PokerStars account, grab Oddsmatcher Pro, get into the community page and let’s make some £’s together. 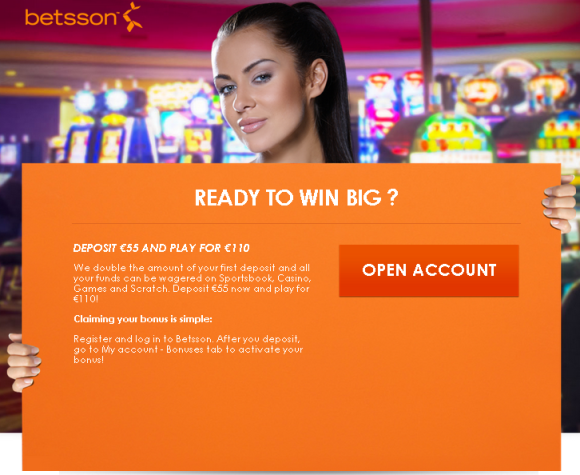 Look forward to seeing you on the inside…..
A 100% sign up bonus upto a whopping €55. As the lady says, this is BIG, look…. We have featured Betsson plenty of times before because of their excellent regular bonuses for existing users. So frequent were they in fact that we even recommended getting an account when they didn’t have a new user bonus. So now there is one on offer, this really is a no brainer. The value of the bonus must be wagered 10x at odds of 1.5 or above but we have given this bookmaker the full Oddsmatcher & Oddsmatcher Pro treatment so getting through this one will be a breeze. Grab an account using the logo below, get signed up and deposited, then head over to Oddsmatcher to get cracking…. – The bonuses must be turned over 35 times in accordance with the wagering requirements as specified in the FAQ in the respective lobbies. – The activated bonus must be wagered within 60 days upon requesting withdrawal. – Bonus money left on the account after 60 days will be forfeited. – The bonus is available on desktop and mobile. The same terms and conditions apply. – Consumption order: withdrawable money, locked money, bonus money. – Minimum deposit amount is 10 EUR/10 GBP/10 USD. Maximum bonus amount is 55 EUR/45 GBP/70 USD. – This bonus is exclusive to players residing in United Kingdom, Ireland, Canada, Australia, New Zealand. – Betsson’s general terms and conditions apply. Top of the fecking morning, our old friend Mr. Patrick Power has allowed us to carry on offering his increased free bet offer of £25 free bet forvever. Again a firm favourite with us here at bet72.com as the qualifying bet can be can be wagered at ANY odds, the free bet is instantly credited and the offer is partner friendly too, meaning you can sign up a second member of the same household and get double bubble on this bonus, nice one Paddy. Time to Celebrate. Footy is Back! Well I hope you all enjoyed the summer break! Yes all over now as Football is back! Honestly I haven’t known what to do with myself since the last game of the Under 21’s on, er well Monday and now, the UEFA Cup, sorry Europa League qualifying starts today. Not bad for a non World Cup or Euro’s year! Here’s some names to conjure with, I would have quite fancied the away trip to Lisburn Distillery FC if I had spotted it earlier! Here are all the first qualifying round ties…. Naturally we have all the games covered on Oddsmatcher so you can pick up any free bets and cash them out for maximum risk free profit to celebrate the start of the NEW season! Welcome back football, I have missed you! Not to be outdone by Paddy Power then William Hill have upped their standard free bet offer to all bet72 users to a very nice £25 forvever too, hurrah. Let the free bets war commence! The regular offer (now that Cheltenham is over) would have reverted back to £10 but we have secured this very special deal for all new sign ups and will be working very closely with these guys in the future, so watch this space for other great offers and with the regular BOGOF deals everyone should have an account here. You need to use the banner below (as this is for all bet72 users and enter code F25) qualifying bet can be can be wagered at ANY odds, the free bet is instantly credited and the offer is partner friendly too, meaning you can sign up a second member of the same household and get double bubble on this bonus, nice one Billy.